Representation | Catherine Piché, Prof.
Class actions, also known as mass torts, have become a vital, developing area of civil law. They offer redress in cases where the costs of litigation might overwhelm the damages to be recovered, particularly in jurisdictions where punitive damages are not widely awarded. They promise efficiencies in the judicial system and level the playing field between plaintiffs and corporate defendants with deep pockets. Class actions make remedies available to plaintiffs that might not otherwise have access to the legal process, and act as a deterrence to prevent defendants from inflicting small amounts of damage across a wide spread of potential plaintiffs. They have been used to negotiate settlements in actions ranging from consumer protection issues to historical wrongs between the state and marginalized communities. 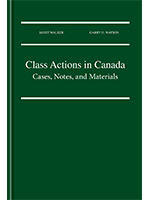 Class Actions in Canada: Cases, Notes and Materials brings together a national team of practitioners and academics to explore leading-edge case law and current legislative regimes guiding the certification process, the determination of representation, and the approval of settlements. 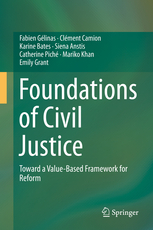 This casebook explores the complexities of multi-jurisdictional actions and the procedural challenges involved in bringing and defending against class actions. Finally, it highlights a number of specific areas in which class actions have been brought to bear, particularly in the fields of environmental litigation, consumer protection, and securities law. Ce contenu a été mis à jour le septembre 9, 2015 à 19 h 59 min.